Figure 5.5. Specificity of (A) κ and (B) λ FLC antisera assessed by interference with the results of typical nephelometric assays upon the addition of various substances. Mean and 95% confidence limits for each added substance are shown. Latex-conjugated FLC antisera were tested for specificity by nephelometry. Potentially interfering substances were added to serum containing known concentrations of FLCs and the changes in values indicated the effect on the assays (Figure 5.5). 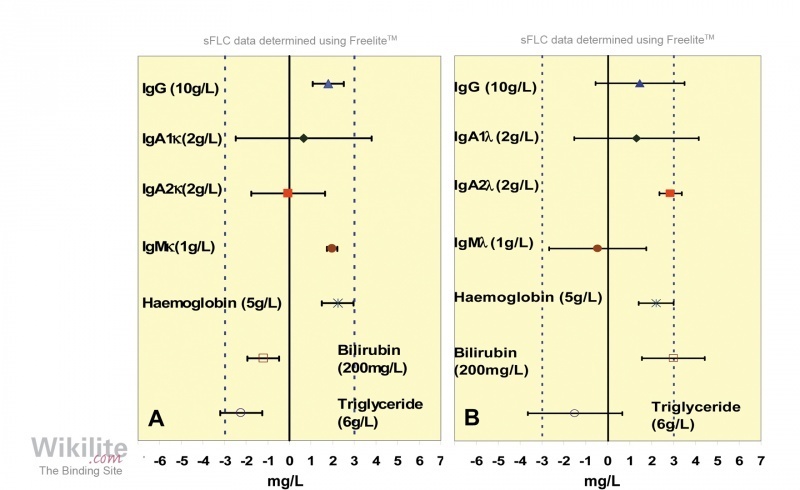 Nephelometric assays demonstrated that FLC antisera had minimal reactivity with light chains on intact immunoglobulins and other potentially interfering substances (0.2 - 0.01%). These values are within the purity specification for FLC contamination in the tested interfering materials. There have been no published independent specificity analyses of the nephelometric Freelite latex reagents. Nakano et al. reported an evaluation but, in error, only tested FLC antisera that were manufactured for immunofixation electrophoresis (IFE), where specificity requirements are less demanding.